Calling all Disney Fairy fans! Here is a cute toy for girls who love fairies, especially Tinkerbell. Introducing Disney Sky High Tink Doll. Tinkerbell is adorable with her flying fairy wings and is fun to play with just as she is. But, what makes this toy even more fun is the pink rose flowered base that Tinkerbell comes with. From this base, you can watch Tinkerbell fly into the air over and over again. 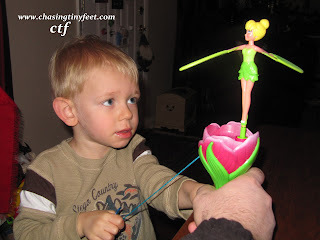 You can make Tinkerbell fly in a few easy steps. First, easily insert Tinkerbell into the base, then give her a twist. Next, pull the string and watch her wings rotate in a spinning motion that will launch her into the air. Lastly, watch her fly out of the flower! Although Mason is young for this toy, I wanted to check it out and see for myself how much fun it could be. Set up of the toy was a breeze and there are no batteries required, which is always a plus in my book. Once realizing the proper way to hold the toy, getting Tinkerbell to fly was not difficult after a few tries. I did not experience her flying 10 feet in the air, but she did go a few feet up before landing on the ground. Mason wanted to play with Sky High Tink right away and once I showed him how to properly insert Tinkerbell and pull the string, he was off and playing. One very important note is that Tinkerbell WILL NOT launch if the device is held at an angle – this is intentional as it is a safety mechanism to prevent injury to people standing nearby. Kids MUST hold Tinkerbell and her rose bud vertically for the toy to properly work. Again, since Mason is young for this toy, my husband and I both helped him to hold it the proper way. He loved watching the spinning motion and giggled each time he got enough momentum going for Tinkerbell to fly out of the flower. I think a child of 5 would be able to play with this toy independently with no problem. Otherwise, they might get somewhat frustrated if they forget to hold the toy properly and the string is unable to be pulled. Right now, Target is the exclusive retailer of the Disney Fairies Sky High Tink Doll with more availability in Spring 2012. It retails for $16.99 and is recommended for ages 4 and up. JAKKS Pacific provided me with the item above in order to facilitate this review. All opinions are 100% mine,.